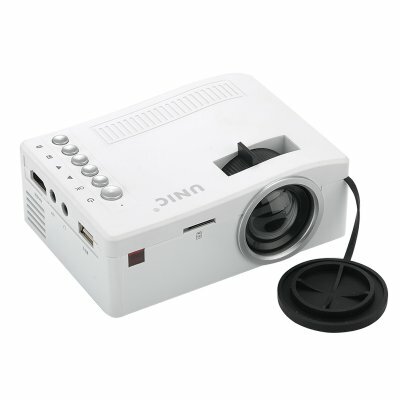 Successfully Added UNIC UC18 Mini LCD Projector - 320 x 180, 48 Lumens, Remote Control to your Shopping Cart. With the Unic UC18 Mini LCD Projector, you have a private cinema right in your backpack. Watch movies, give presentations, enjoy videos and pics on a clear projected screen anywhere you are. The mini LCD projector is a small and simple gadget that comes with lots of practical uses. From entertainment to work, the Unic UC18 Mini LCD Projector can help you enhance any presentation, whether it’s a business report or a bedtime story. The mini projector comes in a compact size, but can project an image of 13-60 inches with the 320x180 resolution. With the 500:1 contrast ratio, the projector will always present a clear and sharp image. The mini projector features easy and simple controls for quick navigation. What’s more, it also comes with a handy remote for even more viewing convenience. The Unic UC18 has great connectivity and can be connected to your other devices via USB or HDMI. It also features a TF card slot for playing files right from the projector. Unic’s mini projector can work with lots of media formats and comes with a built-in speaker and a 3.5mm audio jack. Thanks to the use of LED lamps, the mini projector consumes much less energy than conventional projectors and will offer you up to 20,000 hours of usage time – way more than traditional lamps were capable of. So, if you don’t want to clutter your office or home with too much gear, but still enjoy a nice movie time or often give demos and presentations – the Unic UC18 Mini LCD Projector is just what you’ve been looking for. The Unic UC18 Mini LCD Projector comes with a 12 months warranty. Brought to you by the leader in electronic devices as well as wholesale mini LCD projectors..